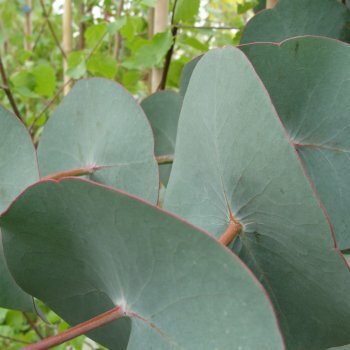 This Eucalyptus tree is popular for its fascinating leaves which are mainly circular, with the stem running through the centre of the leaf; older wood produces lance-shaped leaves. The blue-grey foliage is highly scented when crushed or dried and fragrant old leaves will dry on the branches and can be glided off intact with a central hole, perfect for garlands and decorations. A useful evergreen tree, Eucalyptus Perriniana will grow to approximately 10 x 8 metres in 20 years and makes a fantastic screen or foil for other trees and shrubs. Not only are the leaves an eye-catching feature but the bark is smooth green, cream and brown and peels away creating a fascinating, almost camouflage effect. In the summer, this Eucalyptus produces umbels of creamy white flowers. Also known as the Spinning Gum tree or Round-leaved Snow Gum tree, Eucalyptus Perriniana will grow in any moist, well-drained soil but isn’t suited to a very exposed position. Frost pockets should also be avoided and full sun will produce the very best foliage colour. The Spinning Gum tree is a striking evergreen that will produce a rounded shape with open branching. Our pot grown Spinning Gum trees can be planted at any time of the year. Start by removing all weeds and grass within a metre of your intended planting hole. Dig a square hole as deep as your root mass and approximately 2x as wide. To help your tree establish more effectively, especially if you have poor soil, we advise sprinkling root grow in the hole. Take the pot off and gently loosen the roots, then place into the planting hole. Mix 50% of the original soil with 50% compost, then fill in the hole and firm around gently, making sure not to bank the soil up around the collar of the tree. We recommend using a stake and tie kit and, if your area is prone to rabbits, a rabbit guard too. For further information, visit our help and advice section. If you’re planting in spring, summer or dry weather, water well and regularly for the first few months. Make sure to keep an eye on young Spinning Gum trees and increase watering if there are extended periods of hot or dry weather. If you’re planting in autumn, you may only need to water your tree a little. Spinning Gum trees require formative pruning in the first few years. This should be carried out between February and March. The key thing to remember when pruning a Eucalyptus Perriniana tree is to never cut the central leader stem.